Home » Leopard Seals, Orcas & More! Leopard Seals, Orcas & More! Live-aboard expedition dive boat to encounter leopard seal, dive with Orca, sail among iceberg, hike among penguin colonies and explore historic sites. Feb 18, Day 1: Arrive in Punta Arenas, Chile and connect with the flight to Antarctica, King George Island. Upon arriving to the Island, we will board the Ocean Tramp and cruise away after we settle with all your gear on board. Feb 18-Mar 6, Days 2-17: Sixteen amazing days of cruising and leopard seal and orca diving as we explore the vast islands of the southwest Antarctic Peninsula. From Deception Island in the north (weather permitting, we will land at Bailey Head with its colony of tens of thousands of Chinstrap Penguins). We sail through the breathtaking Gerlache Strait and Lemaire Channel with a good chance of encountering humpback whales, minke whales, fin whales and orca predation. 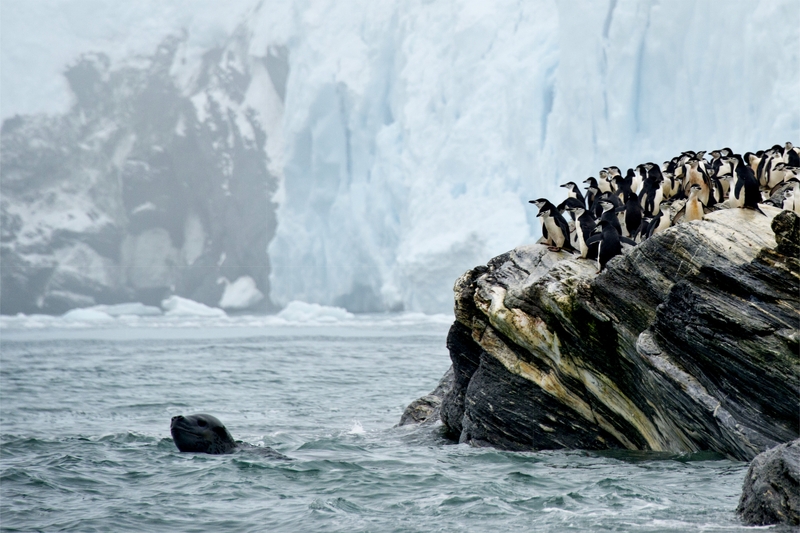 At Pleneau Island, we sail among the stunning vestiges of once massive icebergs, an ‘iceberg graveyard.’ At Pleneau, we frequently bring back the best images of leopard seal predation, as well as from coverville, Port Lockroy, Astrolabe and Gourdin island. During this time, activities include zodiac cruises, snorkeling, scuba diving, hiking, photography workshops, and lectures. With only 8 guests on board, we can be flexible in our itinerary to take advantage of the best that Antarctica has to offer, and better respond to weather and ice conditions to pursue wildlife encounters and photographic opportunities: visiting secluded bays, seeking out remote sites for penguin colonies and leopard seals, staying out long hours for shooting in rare bright light conditions. All in all, we’ve created a perfect platform for both amazing photography and unforgettable life experiences. Mar 6-10, Days 18-21: We leave the Antarctic Peninsula and start our cruise back to Ushuaia, crossing the Drake Passage again. Leave the vessel to catch the connecting flight from Ushuaia to Buenos Aires and onward. ​Please inquire for pricing details.